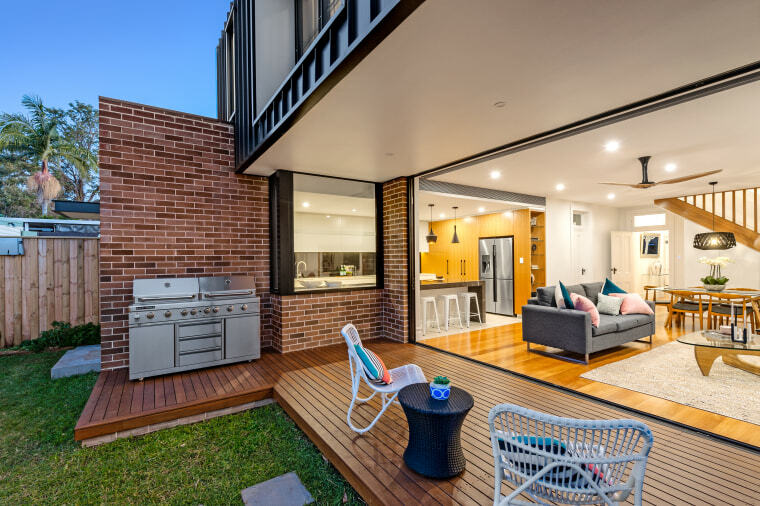 The existing home was a cold and dark Victorian double brick house with poor connection to the rear yard. The brief - upgrade dwelling amenity to the ground floor by connecting to the rear yard, and a first floor addition for main bedroom and nursery. The aim was to restore original components of the Victorian dwelling to their original splendour, both inside and out. Another aim was to add-on to the dwelling with deliberate, contemporary yet respectful form, to delineate between the different eras of design and construction. The Stanmore Residence achieves a sophisticated merging of the old and the new - through a considered use of form, detail and materiality. The contemporary design integrates meaningfully with the restored character home. 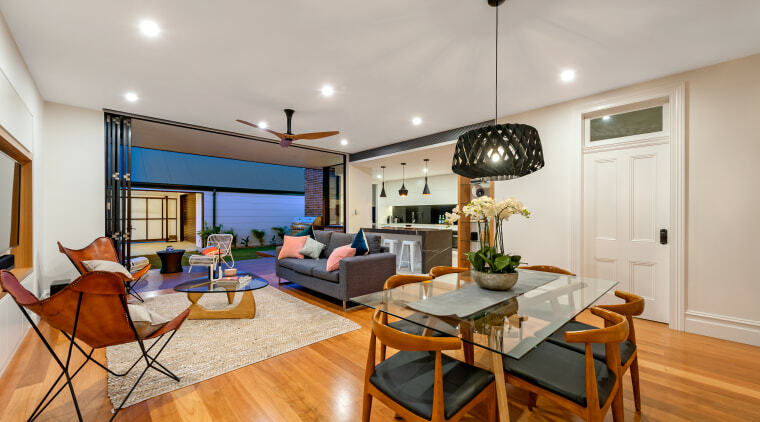 Builder Tim Schramm understood and realised the vision for the renovation which made the process more achievable. The ground floor is a thoughtfully zoned space that flows seamlessly to the outdoor living areas. It includes open-plan kitchen, living and dining areas. The ground floor includes open-plan kitchen, living and dining areas. The kitchen is in centre of house relative to both inside and outside living. It has a large servery with an oversize sashless window to deck. The living room flows out onto the undercover deck via full height, floor to ceiling, 2.7m high bi-folding doors creating a seamless connection between inside and out. Ground floor winter solar access was achieved largely through re-purposing an existing north facing door and window into a large window at the base of the stairs in the shared living zone. Morning winter sun from the north-east washes the kitchen with light and reaches under the projecting first floor into the Living room. There was minimised disruption to original building fabric at ground floor. Ground floor new external walls to laundry in facebrick with parapet detail, and cantilevered, exposed, structural steel awning. The first floor features a large main bedroom with walk-in and ensuite. First floor windows to the north and east serve the first floor bedrooms. The first floor addition is a metal clad faceted cube with recessive openings punched into it for both articulation and solar control. The roof pitch of the cube matches the original dwelling. Materiality and detailing were chosen for their nod to tradition with standing seam roofing details, exposed steel, facebrick and parapet. 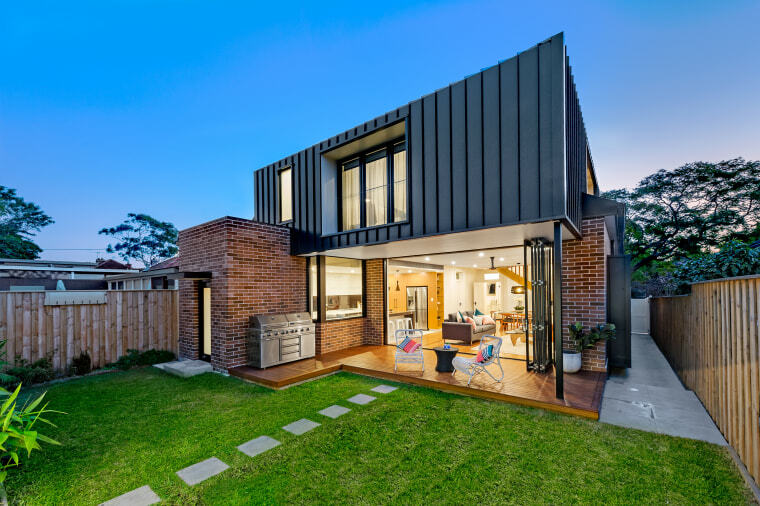 The 2-storey rear addition is recessive yet intriguing within the streetscape, then a contemporary and vibrant sanctuary when enjoyed from the interior and exterior living spaces. Sadly the owners did not get to live in the house for long as work commitments saw them move interstate. 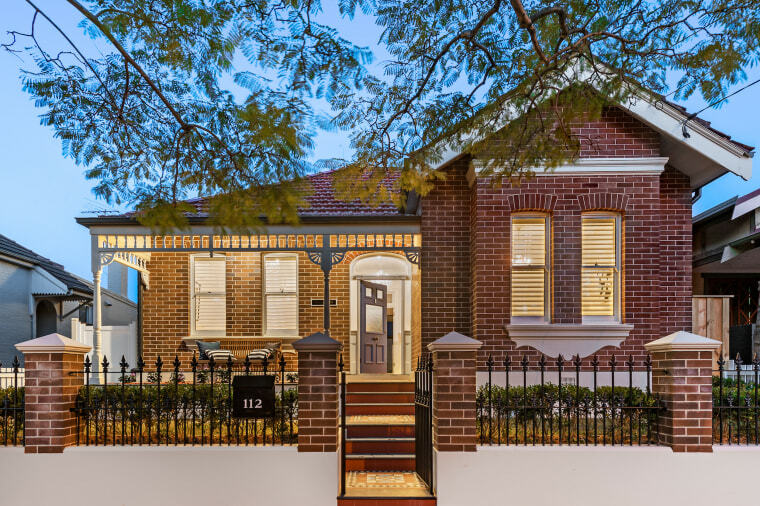 On selling the house it achieved a new sales record for the Stanmore suburb.